A search through digitised old Australian newspapers by webmaster Martin Hansen has thrown up Winnibelle, a boat claimed to be built to a design by Harrison Butler. The claim is in Perth's Western Mail dated Thursday 30th November 1950 where the boat is described as a taking part in a “cruiser race”. This boat is not in the records held by the HBA. 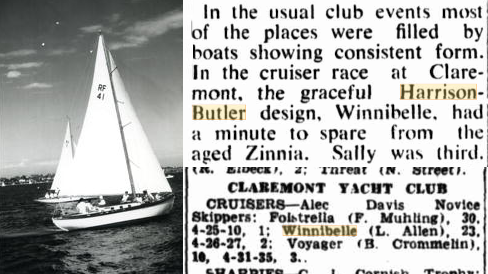 Further investigations resulted in a picture of Winnibelle racing at the Royal Freshwater Bay Yacht Club in 1964 and some racing results from March 1949 from the Claremont Yacht Club, in Freshwater Bay. The RF in the sail number references Royal Freshwater. Is Winnibelle A Harrison Butler Designed Boat ? The HBA is aware of two or three boats built in Australia to Harrison Butler's Thuella design of 1944 that we have been unable to assemble sufficient knowledge of to put on the website. However, Winnibelle does not have the characteristic rudder arrangement of this design. She does, however, have a resemblance to the Sinah design published in 1943, and which features heavily in Cruising Yachts : Design and Performance published in 1945. More evidence is needed to settle the matter. Further information on Winnibelle is sought.